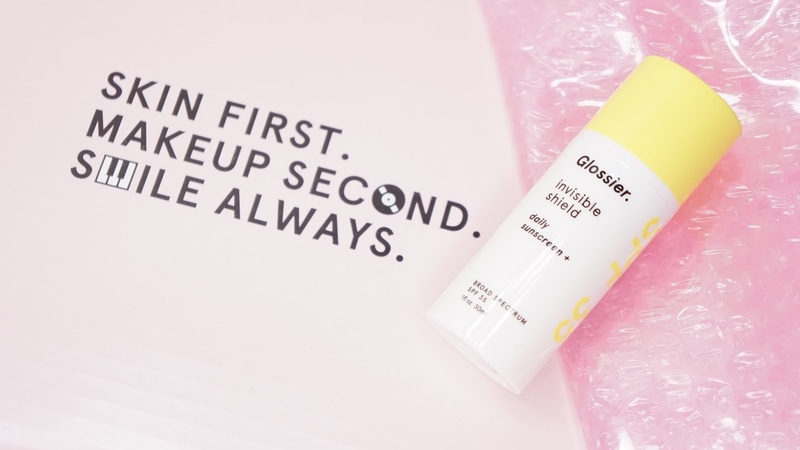 I'm so excited about this post since it's about a very exciting new launch from Glossier! About two and a half weeks ago, Glossier sent me the new Invisible Shield Daily Sunscreen SPF 35*. I'm not even a brand rep and so I was pretty pumped to be able to test it out before the official launch. I'm also really pumped that they sent this to me for free as a PR sample too. I'm not the greatest with skincare and I mostly go with what feels and superficially looks right, but I'm going to try my best to do this sunscreen justice since it is a good one! Each tube retails for $34 and contains 1 fluid ounce / 30 mL of product. Some of the claims include being able to quickly absorb into the skin without any greasy residue and zero white cast. It's also described as a "clear watergel formula filled with active microcapsules." The active ingredients include 3% Avobenzone, 6% Homoslate, and 5% Octisalate. From what I can find (and more importantly - understand), this sunscreen is a Chemical Sunscreen. 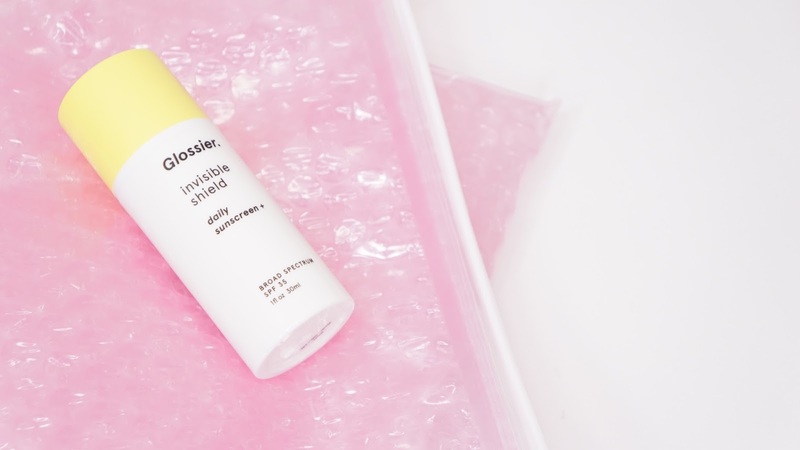 Unlike the Titanium Dioxide and Zinc Oxide that is found in Physical Sunscreens, it's less likely that the ingredients in the Glossier Invisible Shield to leave a white cast. Because there isn't a white tint, it's been working really well for me in all circumstances even with flash photography. Chemical Sunscreens work by absorption and so it's important to let the product sink into your skin before it's effective. I 100% agree with Glossier in that it does quickly absorb into the skin though and so it's pretty quick and easy to apply. Some of the other key ingredients Glossier mentions are Vitamin E, Vitamin P, Broccoli, Aloe Leaf, Fermented Yeast and Vegetal Extract. There is also Sweet Orange Essential Oil in it to give the sunscreen a more citrus smell to it. There's also no alcohol and so the smell is perfect for a person like me who doesn't like the typical sunscreen scent. I personally use a lot of SPF 50, but I think that's also partly because most of the sunscreens I use are from Japan and South Korea and the majority of them are SPF50. According to Dr. Wang (referenced below on source #4), SPF30 "blocks 97% of UVB rays" and SPF 50 "blocks 98% of UVB rays." The Glossier Invisible Shield Daily Sunscreen also falls between Dr. Wang's suggestion of using between sunscreen between SPF30 to SPF50. The texture is pretty interested since the microcapsules are pretty visible, but they quickly break apart and absorb/blend into the skin. It feels really light as well and so that's another tick on the Glossier claims! It does not feel greasy at all and all the foundations I have used top top of it has looked great (or you know... as good as they would have even with the sunscreen not underneath). Some of the other sunscreens I've tried have made my face greasier throughout the day, but this product just adapts to the base I put on top of it. This sunscreen also doesn't have any alcohol in it and so it didn't dry out or accentuate the dry patches on my skin. I don't usually reapply my sunscreen though since I'm wearing foundation and/or other base products and so I wasn't able to test out reapplication. If you weren't wearing a base product, it is easy to just slap back onto your face. So far, it's huge check marks and thumbs up from me but I'm not a fan of the price of this sunscreen. It takes me about slightly over a year to finish a 1 ounce bottle of foundation of non stop use, but I only use maybe a pea sized amount of it for my whole face only on weekdays. Dr. Hale (referenced in source #5), recommends about a nickel sized-dollop of sunscreen for the face alone and I've also heard of using about 1/4 of a teaspoon of sunscreen as well. The sunscreen has a pump and so I'm using about 2-4 pumps a day for my full face. I'm going to pretty quickly go through this bottle of sunscreen and at $34 a bottle, my wallet is going to be crying. But back to the pros. This is one of the best Western sunscreens I've tried in a really long time. Even after two weeks of wear, it has not broken me out and it's been the one I've been reaching to the most. I've tried a lot of the Japanese Biore sunscreens and even though they're probably my HGs (low price but high performance!! 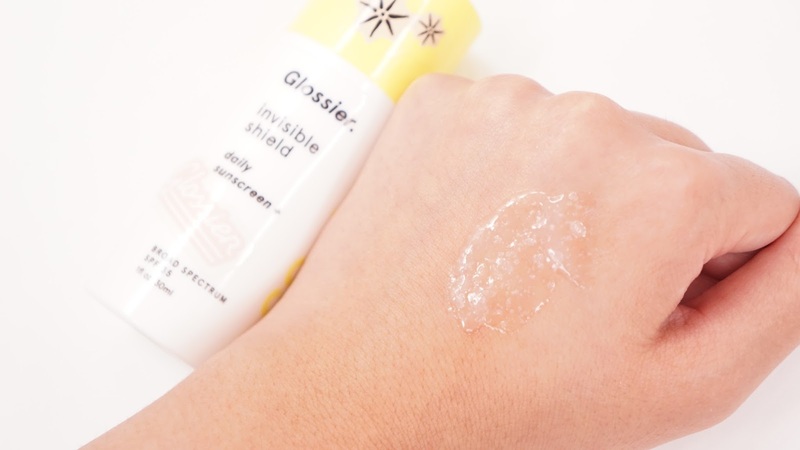 ), the Glossier Invisible Shield Daily Sunscreen is probably a close 2nd place. Skincancer.org : Ask the Expert: Does higher SPF (sun protection factor) sunscreen always protect your skin better? Skincancer.org: Ask the Expert: How much sunscreen should I be using on my face and body? Final thoughts: I'm a huge fan of the Glossier Invisible Shield Daily Sunscreen! It's quick and easy to use and there's no whitecast. I've read that some people are allergic to the ingredients in Chemical Sunscreens, but I didn't experience any break outs or reactions. I was seeing all these promo shots from Glossier about how this is something you would want to apply everyday (versus feeling obligated to) and I really agree. It's a lightweight SPF that just works with every base product I've tried and so I feel comfortable wearing it without worrying about whether or not my face is going to end up looking melted. I am sad about the price and so I'm going to be pretty hesitant to repurchase it, but it's probably the best Western sunscreen that I've tried that is easily (ish?) accessible and so it is going to be high on the repurchase list if needed. Will you be purchasing this sunscreen? What is your favorite sunscreen to use everyday? *As mentioned, Glossier sent this to me. I wasn't under obligation to post anything about it and all thoughts are 100% honest and my own.